Our economy is thriving now more than ever, and entrepreneurs are at the forefront of our economic success. As small employers figure out how to meet their particular needs while keeping costs down to grow their businesses, they are increasingly relying on the growing freelance economy, rather than the traditional workforce. Despite a growing reliance on independent workers, inability to access and provide benefits is still a concern. Costs are a major barrier to their ability to provide benefits, but what small businesses and freelancers need are flexible options that reflect the variable nature of their work. New scientific opinion polling reveals small business owners’ views on an array of solutions that could help entrepreneurs, freelancers and small business employees better prepare for the future. The poll, conducted May 1-7, 2018 for Small Business Majority by Greenberg Quinlan Rosner Research found small employers struggle to access and provide benefits like retirement, healthcare and paid leave, and turn to independent workers to meet their needs. Additionally, they support flexible solutions to make it easier for entrepreneurs and small business employees to save for the future. Small business owners rely on the freelance economy to keep their businesses running: More than half of small business owners (52%) have hired independent workers in the past year, and of those, more than one-third (36%) say they plan to hire more in the next year. Small business owners report hiring on-demand workers to provide greater flexibility, assist with specific projects and to help keep costs down. Most small business owners struggle to offer benefits to employees: Less than 1 in 4 small business owners (23%) offer any one benefit to all of their employees. 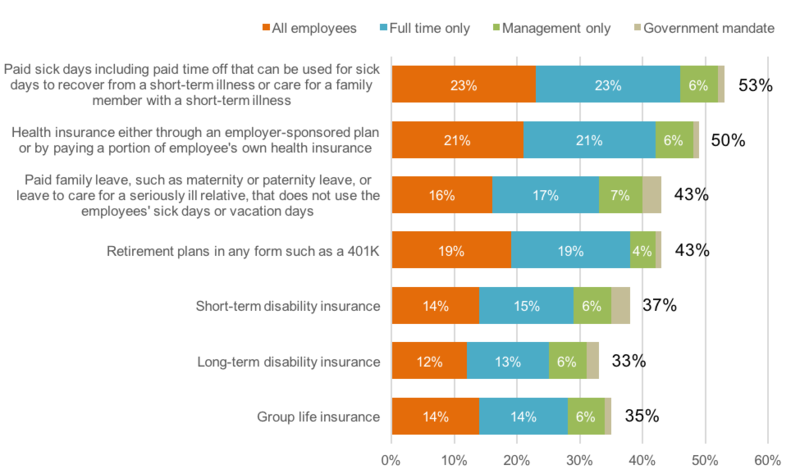 More than half of small business owners provide paid sick days, but only 23% provide it to all of their employees. The amount provided decreases with other benefits such as retirement plans (19%), health insurance (21%), paid family leave (16%) and more. Thinking specifically about your business, for each item below, please indicate whether this is something you currently provide to employees or something you do not currently provide to employees, not including those that are mandated by local, state, or federal government. Small business owners identify obstacles to offering retirement benefits: When it comes to retirement plans specifically, small business owners say their biggest barriers to providing this benefit to their employees are that it’s too expensive (34%) and that their business lacks the resources to administer a plan (23%). Vast majority support auto-IRA programs in their state: Nearly 7 in 10 small employers (68%) support an auto-IRA or Secure Choice program, in which workers of small businesses that don’t currently offer a retirement plan would be automatically enrolled in a state-created IRA. 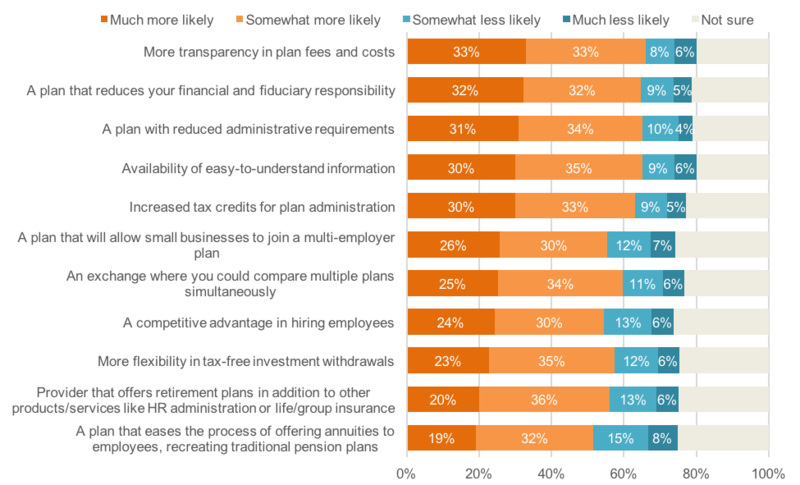 Employers strongly support additional proposals to provide flexible retirement options: Small business owners identified other features they would support in an employee retirement plan that would make it more likely for them to be able to offer a retirement plan to their employees. This includes more transparency in plan fees and costs (66%), a plan that reduces the employer’s financial and fiduciary responsibility or that has reduced administrative requirements (65%), increased tax credits for plan administration (63%), and plans that would allow small businesses to join a multi-employer plan (56%), among other features.